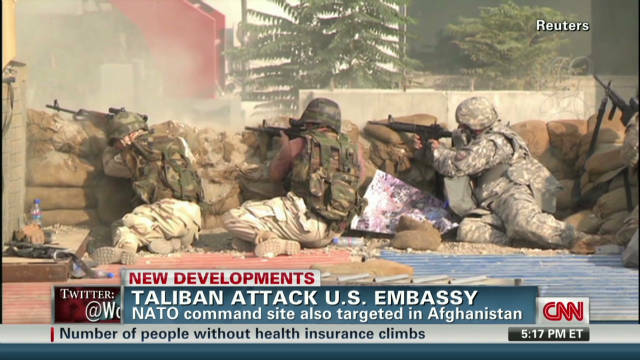 Kabul, Afghanistan (CNN) -- A nearly day-long Taliban siege on the U.S. Embassy and NATO command center in Kabul ended early Wednesday, Afghan and NATO officials said. A policeman and two civilians were killed and 21 civilians were injured, the Interior Ministry said. Six militants have been killed and the building they were firing from has been cleared, the ministry said. The strike in central Kabul began Tuesday amid intelligence that insurgents might launch a high-profile attack in the capital around the 10th anniversary of the September 11, 2001, terrorist attacks against the United States, a coalition officer and a senior official of NATO's International Security Assistance Force confirmed to CNN. 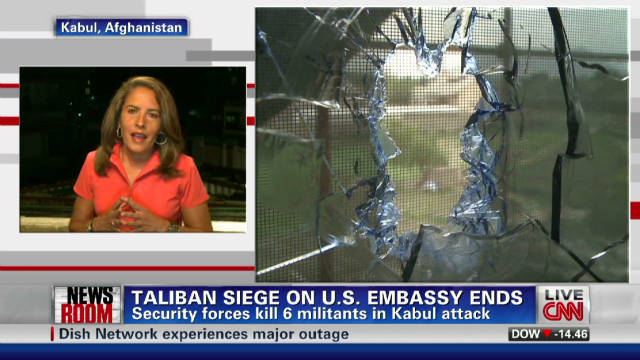 Taliban spokesman Zabiullah Mujahid told CNN that his group targeted "the U.S. Embassy, governmental organizations and other foreign organizations." ISAF said after insurgents attacked the targets Tuesday afternoon "with small arms fire from outside the secure zone surrounding these compounds," Afghan security forces "responded immediately." Afghan National Army helicopters provided air support. 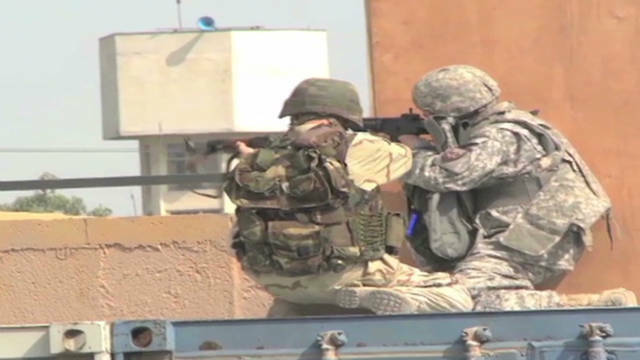 Afghan and international troops "trapped the insurgents in the partially-constructed, multi-story building they were using as a firing position, and conducted a methodical, floor-by-floor clearing operation," ISAF said. Central Kabul is considered a high-security area, and it is protected by police and other security forces. ISAF said six of its personnel were wounded in operations through the day Tuesday. Casualties occurred in three incidents Tuesday in other parts of the city, the Interior Ministry said. Three police officers were killed, and six people -- three police and three civilians -- were injured in suicide attacks. U.S. Ambassador to Afghanistan Ryan Crocker said he believes the Haqqani network -- a pro-Taliban militant group based in Pakistan's North Waziristan region -- was behind the attacks in Kabul and another in Afghanistan's Wardak province over the weekend. Crocker played down the significance of the incidents while speaking to reporters Wednesday, describing the attack on the U.S. Embassy as "harassment rather than a direct attack." "If that's the best they can do, you know, I think it's actually a statement of their weakness and more importantly since Kabul is in the hands of Afghan security it's a real credit to the Afghan National Security Forces," he said. "They are the ones that took down the building and took down those attackers." Gen. John R. Allen, ISAF commander, echoed that message Wednesday, saying: "Afghan security forces responded bravely, contained the insurgents and systematically eliminated the threat. "Once again, I was impressed by the courage, skill and fighting spirit of Afghan forces. 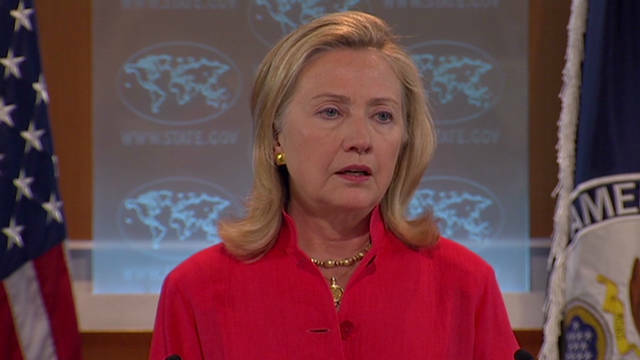 The insurgency has again failed." The attacks in Kabul continued what has been a violent period. Over the weekend, two Afghan laborers were killed, while 77 U.S. troops and 25 Afghan workers were wounded in a truck bombing on an ISAF base in Wardak province. Last month, Taliban suicide bombers killed at least eight people in Kabul when they attacked the British Council, a British-government-affiliated body that fosters cultural and academic exchanges. The Taliban harbored the al Qaeda network that launched the 9/11 strike. A U.S.-led coalition toppled the Taliban and has been fighting militants in Afghanistan for nearly 10 years. NATO is drawing down and handing over security control to national forces. Some 10,000 U.S. troops are scheduled to depart by year's end, with all U.S. military personnel out of Afghanistan by the end of 2014.